Quickly adapting with latest developments and improvising on current situations is the need of the hour in the modern business environment. Digital applications are making giant leaps – leading the list is the mobile app. The need for App Development Company in Chennai has been realized like never before. Businesses are looking for domestic mobile app development service providers with international standards. We are an exclusive mobile app development company located in the IT Hub, Chennai, and we have pride in being able to go the extra mile with regard to quality, standards, and client satisfaction. With expertise and experience in building web and mobile apps, we have reached the niche of being the best app development company in Chennai through relentless and dedicated service to customers. For sharing thoughts and partnering with us, you are welcome to visit us at Stall # 4 at the TieCON 2017! A unique opportunity to project and promote your business! The need for a tech-driven and informative promotional strategy is being increasingly felt by businesses in the recent times. 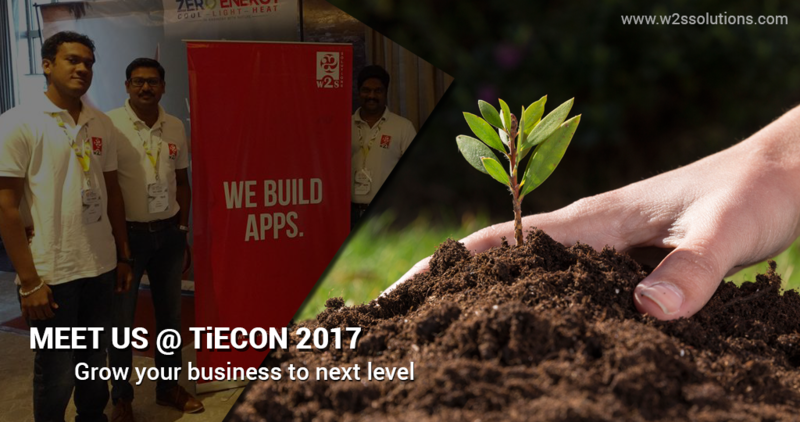 Tiecon Chennai, the global community enables entrepreneurs across the world to grow their businesses. This entrepreneurial organization is organizing a massive conference of global talents in Chennai, with the view of fostering the entrepreneurs of the next generation. Giving every entrepreneur the opportunity to exhibit and flaunt their products and services, TieCON 2017 is a mega event planned to enable aspiring entrepreneurs, investors, and veterans to congregate and excel. Chennai being one of the biggest entrepreneurial conclaves in the nation, you not only get to measure the demand for your product but also to project it to the maximum number of potential clients. We at W2S Solutions aim at being the most sought after Science and Technology solutions providers. We have been chosen to collaborate with the National Institute of Ocean Technology for building IISF Android and iPhone solutions. We have the privilege of having been involved with the renowned GetSpini team in creating the web application that proves very useful in the Indian market. Developers from W2S joined hands with their core team in building their vision. A unique web application as well as mobile app that provides assistance to Fleets, Tours, Travels, and Delivery-related businesses in effectively managing their operations has been designed by us. Our product offers easy-to-use IT Solutions to transport, logistics, and delivery companies in India. We have developed a reliable invoice management and payment processing application focusing primarily on entrepreneurs and SMEs in the Indian sub-continent. Helping businesses in tracking their cash flow and expenses efficiently, our invoicing software ensures not only hassle-free invoicing but also effective payment collection. You have to love the festive season, especially when the best events of the year are scheduled around it. It gives you the chance to take that much needed break from the desk, and mingle with the best minds in the industry. This week we are looking forward to the 9th Annual TiECON hosted at ITC Grand Chola, Chennai. For all budding entrepreneurs, technocrats and tech enthusiasts, TiECON is one of India’s largest entrepreneurship conference that began a few years ago. It is the most-awaited event of the year spread over two days, hosting over 1500 attendees across industries. Speakers at TiECON Chennai this season include Guru Bhat (PayPal), Ambareesh Murthy (Pepperfry.com), Dangfeng Li (Alibaba Group), and Dave McCaughan (Bibliosexual) among several other successful entrepreneurs dishing out the best advice on brand building, thought leadership, and leveraging your skills for the best outcome. Everyone wants to take their business to the next level, so workshops and seminars conducted by Rajiv Lochan (The Hindu Group), SudhirSethi (IDG Ventures India Advisors), Kris Gopalan (Infosys Technologies), and more such thinkers from the elite club will certainly turn this into an enriching experience. Any entrepreneur’s biggest concern is winning the hearts of investors, customers and employees. The PitchFest 2016 session challenges you to make your best pitch to VCs and angel investors from across the country, all under one roof, increasing the opportunity to expand your startup or even give life to a brand new idea. We bagged a stall at TiECON this year, and will be showcasing our best offerings as one of the best SaaS based App developers in the industry. Check out our recent success stories, talk to our technical consultants, and let us redefine your perception of app design and development. Stop by our stall while you are at ITC Grand Chola on November 4th and 5th. Join us for a refreshing discussion on new age digital marketing, and how to build a successful digital brand. It will be an appsolute pleasure to meet you. W2S Solutions is an Apps development company located in Chennai and building web and mobile apps for SME’s and Entrepreneurs. It’s recent apps in Insurance, Healthcare, FinTech industries help customers to regain market share and improve operational efficiency. W2S Solutions knows how to design, develop and build Enterprise Apps that increases new customer acquisition and retention. Our Innovative products help businesses to quickly bag the benefits of digital Era. Visit us at TieCON 2016. It’s a myth that techgeeks are pale-skinned people who stare at the blue screens for too long. At W2S Solutions, we prefer to think of ourselves as artists. The keyboard is our instrument of choice, and we create art with fingers dancing across the keyboard with the same graceful agility as Mozart or Beethoven. We do however tend to stay indoors a lot creating the best technology experience for customers, but when the right time comes we grab the opportunity to networking with peers, broadening our knowledge and showcasing our best work at the best tech conventions in the midst of food, beer, and laughter. When the leaves turn yellow, every heart in the world yearns to take a break and travel to places that take your breath away. We like mixing business with pleasure especially when it takes us to a place that is known as the home to a little bit of everything. Apart from the gorgeous twin peaks, surfer’s favorite Bay, good ol’ Chinatown, feels of Paris, ferry and cable cars, our destination aka The Golden City is also home to some of those favorite digi-giants like Twitter, Pinterest, Yelp, Dropbox, Reddit, Mozilla, Salesforce.com and Airbnb. This September, San Francisco is going to be buzzing with people (more than usual) who will be disrupting more than just the city routine and traffic. The best entrepreneurs, hackers, investors & techgeeks join TechCrunch at Disrupt SF 2016, a most awaited event by a global authority that introduces the world’s most innovative startups, and disruptive technologies. We seem to have the best of many worlds with Disrupt SF 2016 hosted at Pier 48, enticing us with three days of on-stage interviews with key innovators, Startup Battlefield competition, a 24-hour Hackathon challenging development geniuses to create a product in 24 hours, Startup Alley to showcase new tech & talent, and the After Parties everyone raves about. While we are looking forward to a full tour of the city including a beautiful view of the Golden Gate Bridge, a visit to Alcatraz, and maybe a game at AT&T, we are also thrilled to meet with Diane Greene (Google Cloud), Jeff Lawson (Twilio), Tim Armstrong (AOL), Marni Walden (Verizon), and a ton of other influencers who have a lot of ground-breaking wisdom to impart about what’s going to turn technology around in the years to come. W2S Solutions is breaking into new markets this year, expanding from building game-changing mobile apps, web apps, and data analytics solutions to offering a larger range of digital branding solutions. We hope to get acquainted with radical minds, exchange ideas and have a great time. Stop thinking about pancakes and start packing. This fall event is going to be disruptive! With only a day left to diwali and incessant rains over the weekend, It had clearly impacted the sale of businesses in chennai, However they are still working hard to pull customers with lucrative offers and promotions! We all know that Entrepreneurs usually receive best offers from corporates, but they have the hunger and passion to implement their ideas into a viable business plan. Our team understands what it takes to be successful in their business. We pair this knowledge with our advanced planning,design and deployment execution skills to deliver industry leading concepts. W2S Solutions is a custom Mobile app and web development company that thinks outside the box to build award winning Apps for startups and SME`s around the world. Our team has 12+ years of Total IT Experience, 45+ satisfied clients, 200% expansion in 2014 and 5 offices around the globe. We will be attending the upcoming two-day TieCON seminar on entrepreneurship themed ‘I can do it’, starting on October 31 in Chennai. It promises to be bigger and better! With two days of networking and idea exchange, the event has a lot to offer to the delegates. It is an opportunity to meet old friends and make new ones.